I have been curious about tatting since the first time I saw one of those strange little shuttles at the craft store next to the embroidery floss. I have always kind of know I'd get around to trying it. 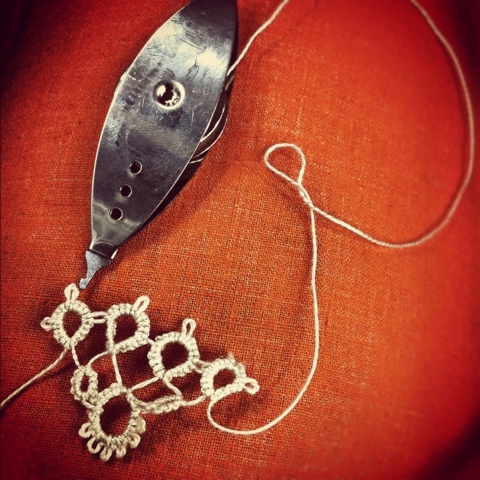 I have a passion for historical crafts and lacy, dainty things. Hah. So this past week I picked up a shuttle and some ecru colored thread and went about learning. I quickly found that while it's numbingly abusive to the finicky, detail-oriented part of my brain, the part of my brain that does math and manages my OCD was intensely satisfied. What could be better than counting and having to pick out little tiny knots every few minutes? Did I mention I love to untangle knots? Above is the link to the tatting tutorial that I used to learn. I think I also pulled up a little video on youtube when I learned how to join picots, but I honestly can't find the link. Forgive the poor linkage, please. I'm posting from my phone and blogger still has a seriously inferior app for posting (I'm considering checking out Wordpress for this very reason). Needless to say, I am hooked (heh) and I urge anyone who has a mind for patterns and hand-work, and who can understand tension, to give it a shot. I've been making bits of tatted lace to trim some of the projects I've been working on and it's so satisfying to complete! Have you ever tatted? Do you find yourself tatting in your sleep now, like I do? Haha!